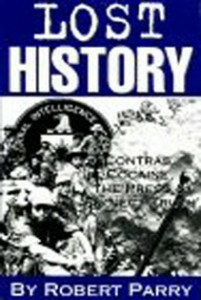 From Robert Parry: As part of our effort to clear out warehouse space and distribute the valuable journalism we have done over the years, we are offering the three-book set Lost History, Secrecy & Privilege and Neck Deep at the deep discount price of only $29 for all three, postage included. With the full-carton offer, you have a choice of a half-and-half split of Secrecy & Privilege and Neck Deep (14 each in paperback). Or a full carton of either book, 28 in paperback. Or a full carton of 24 hardback copies of Neck Deep. The three books include some of most important work we have done at Consortiumnews.com over the past 16 years. 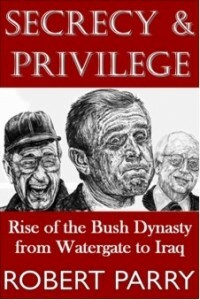 For a donation of $100, we will send you a gift, autographed copy of Neck Deep (or another book by Robert Parry, either Lost History or Secrecy & Privilege or Don North’s DVD “Yesterday’s Enemies” just tell us your choice). We also will continue to offer full cartons of Secrecy & Privilege and Neck Deep 28 books to a carton for only $59. We have to reduce our book stockpile by about 20 more cartons so we can close out our warehouse space and move the remainder into a corner of my house. What I really don’t want to do is throw out any of these books. Too much hard work went into them. Go to the Consortiumnews.com’s donation site and put in a $29 charge (for the three-book set) or a $59 charge (for a full carton) on your Visa or Mastercard. Follow up with an e-mail to consortnew@aol.com to give us your mailing address and your book selection. Besides helping us save on our warehouse costs, a portion of each book purchase will go keep the Consortiumnews.com Web site alive. You can use the books as gifts, donate them to local libraries or resell them. One public radio station in Texas used Secrecy & Privilege as a premium gift for a fund drive, with me on for an hour to help the station raise money. What I really don’t want to do is throw out these books. Too much hard work went into them. –Go to the Consortiumnews.com’s donation site and put in a $59 charge on your Visa or Mastercard. Follow up with an e-mail to consortnew@aol.com to give us your mailing address and your book selection. You can get a 50-50 split of Secrecy & Privilege and Neck Deep (14 each in paperback). Or a full carton of either book in paperback. Or a full carton of 24 hardback copies of Neck Deep. –You can also order with a check made out to The Media Consortium; Suite 102-231; 2200 Wilson Blvd. ; Arlington, VA 22201. If a full carton is too much for you right now, you can also help us by ordering just a two-book set for the discount price of only $19. Again, I’ll pay the shipping and handling for U.S. orders. (For foreign orders, just add $10 for the extra shipping.) For the two-book set, you can use the same payment methods mentioned above. —Neck Deep by Robert, Sam and Nat Parry takes this remarkable story of the Bush Family’s rise forward to George W. Bush seizing the highest office in land with the help of the Right’s powerful propaganda machinery, the systemic failure of the mainstream U.S. news media, and the coup d’etat of Republican political cronies on the U.S. Supreme Court handing Bush the White House. Besides helping us save on warehouse costs, a portion of each book purchase will go keep the Consortiumnews.com Web site alive. We will be offering the thank-you gifts that were available during the fund drive for a while longer.